The returning astronauts back on land. After spending 186 days in space, astronauts Tim Peake of the European Space Agency, Tim Kopra of NASA and Yuri Malenchenko of the Russian space agency Roscosmos have arrived safely back on planet Earth after their stint on the International Space Station. Their entry capsule hit the Kazakhstan ground at 3.15pm local time and the three returning astronauts were immediately put through a barrage of health checks. 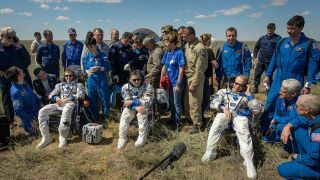 Peake, Kopra and Malenchenko were part of Expedition 47, part of NASA's research into the long-term effects of being in space on the human body. "[It's] the best ride I've been on ever," British flight engineer Peake told the BBC after landing, before requesting a cold beer and a pizza. During his time on board the ISS, he ran the equivalent of the London Marathon while strapped to a treadmill. "From the potential development of vaccines, to data that could be relevant in the treatment of patients suffering from ocular diseases, such as glaucoma, the research will help NASA prepare for human long-duration exploration while also benefiting people on Earth," explained the space agency in a press release. This kind of long-term research into the effects of extended space living is going to be essential if we're going to realise the dream of making it to Mars. NASA thinks it could be possible by the 2030s but the journey takes 8 months with today's technology - that may get shorter as new rockets are developed but it's still going to be a long stretch. Unfortunately Tim Peake and Tim Kopra were too exhausted to make the official post-landing press conference but you can expect to hear more about their exploits over the coming days. Three people remain on board the ISS with three new crew members scheduled to arrive next month.